Leg or hip pain is a common complaint that active patients often treat with rest and mild pain medication. Often, the symptoms resolve without requiring medical attention. When pain recurs, these patients seek medical attention to relieve the symptoms. The interactive case study that follows aims to reinforce the basics of medical diagnosis by focusing on a patient with multiple etiologies for this common complaint. A 52-year-old man presents with a primary complaint of left leg pain that has been present but intermittent for 1 year. He describes the pain as burning and tingling, originating in the hip and radiating to his lower back and down the leg. He denies any weakness or numbness of the leg. The pain is predominantly brought on by exercise (eg, hiking, biking, swimming) and can force him to stop but resolves within minutes of rest. He has a history of back pain secondary to lumbar disc disease, which required laminectomy 4 years earlier. At that time, he noted constant pain in his back and both legs with weight bearing. His current pain, however, is different and unresponsive to anti-inflammatory medications. The rest of his medical history is unremarkable; he is a nonsmoker and nondiabetic. Highlight Point #1: Patient history is critically important and should be obtained “fresh” with each patient encounter. The electronic medical record cannot replace the acquisition of these facts firsthand from the patient. On physical examination performed by his orthopedist, the patient is found to be neurologically intact with normal foot and plantar flexion. A straight leg raise test is negative. No pain is appreciated with leg rolls; however, the FABER maneuver (ie, flexion, abduction, and external rotation of the hip) causes some discomfort. No pain is elicited on palpation of the greater trochanter and distal region, no bruits are appreciated, and no varicosities are present. Plain radiographs of the lumbar spine and hips are unremarkable, but MRI reveals degenerative disc disease at L5-S1, with mild disc protrusion and a minor labral separation in the left hip acetabulum. He is treated with two steroid injections into the lumbar spine followed by four separate hip trochanteric bursa injections given several weeks apart. The initial hip injections offer some temporary relief, but the later injections provide no benefit. Highlight Point #2: When therapy is ineffective, rethink the diagnosis by obtaining a “fresh” history, and expand your physical examination by developing a differential diagnosis at the time of examination. This simple process directs testing more specifically and minimizes the need to “shotgun” tests unnecessarily. Figure 1. Baseline arteriogram showing right common iliac artery stenosis and left common and external iliac artery occlusion (A). 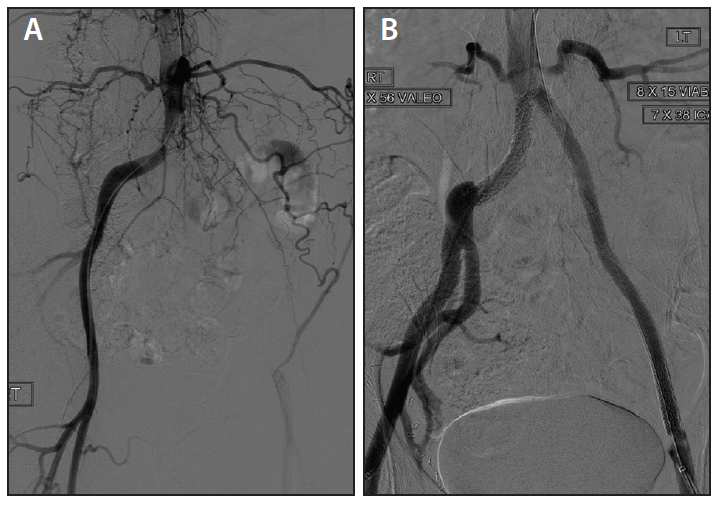 Completion arteriogram after stenting the right common, left common, and left external iliac arteries (B). The persistent symptoms of the left hip lead to an evaluation of his vascular system, even though his symptoms are not typical of claudication. Physical examination reveals an absence of pulses in the left leg but palpable pulses throughout the right leg. Ankle-brachial indices (ABIs) are abnormal in both legs (right leg, 0.78; left leg, 0.59). Duplex ultrasound identifies a significant stenosis in the right common iliac artery (peak systolic velocity, 475 cm/s [normal is approximately 100 cm/s]) and occlusion of the left common and external iliac arteries. A basic hematologic workup is unremarkable, with a normal complete blood count, coagulation studies (including anticardiolipin antibodies), and lipids. Arteriography is then performed (Figure 1A). Which diagnosis most likely explains these findings? Answer: A The most common cause of aortoiliac disease is atherosclerosis. However, it is uncommon in younger patients without underlying risk factors such as smoking, diabetes, or severe dyslipidemia. The stenosis of the right common iliac artery suggests that perhaps there is a similar stenosis in the left common or external iliac artery with subsequent thrombosis. This seems to be the most likely explanation based on probability and the angiographic findings. Less common causes include answer options B through D. EIAF is predominantly seen in long-distance cyclists who log extensive miles over the course of years. The external iliac artery typically remains stenotic without thrombosis and leads to typical muscular pain of the buttock, thigh, and calf with exertion. This diagnosis would not explain the right common iliac stenosis nor the absence of the left internal iliac artery. Primary thrombophilia leading to arterial thrombosis or embolization also seems unlikely considering the patient’s age and no previous history of thrombosis, cardiac abnormalities, or cancer. Antiphospholipid syndrome can present with iliac stenosis with thrombosis, but the classic anticardiolipin antibodies were absent. The arteriogram is inconsistent with embolization. Likewise, the arteriogram is inconsistent with spontaneous iliac dissection, which shows a normal aorta (patent lumbar arteries with no obvious dissection) and nonostial right common iliac artery stenosis, although dissection underneath the occlusion cannot be excluded. We are left with a default diagnosis of atherosclerosis but no rationale as to “why” he would develop peripheral artery disease. At the time of the diagnostic study, he undergoes balloon angioplasty and stenting of both the common and left external iliac arteries (Figure 1B). His symptoms resolve and his ABIs normalize. Four months after the vascular intervention, the patient complains of constant numbness and stabbing pain in the left hip that radiates to the thigh and is not exacerbated by exertion. He states, “It just doesn’t feel right,” and wonders if the pain is associated with the access site used for stent placement (ie, common femoral artery) or recurrence of his previous hip problem. On examination, he has normal pulses of both lower extremities, with a subtle bruit in the left groin. There is no redness, fullness, or mass noted in the left groin. There is also no lower extremity edema. A straight leg test is unremarkable. His hip pain could be reproduced with leg roll and the FABER maneuver. Based on the clinical course, what would be the best diagnostic study to evaluate this patient’s symptoms? Answer: B Venous duplex ultrasound can identify venous pathologies and lymphadenopathy, but his symptoms and physical exam findings seem inconsistent with venous disease, pseudoaneurysm, iatrogenic fistula, or mass. Plain x-ray or MRI could be repeated and then compared with previous study, evaluating for recurrent musculoskeletal abnormalities of the lumbar spine. However, a CT scan with contrast would more fully evaluate these symptoms in the context of his initial unexplained arterial occlusion after normalization of his arterial anatomy. Abdominal and pelvic CT scans are performed and confirm that the iliac arteries are patent (Figure 2A). A soft tissue density mass is found involving the left psoas muscle, encasing the left iliac artery/vein and causing left hydronephrosis. It is predominately hypoechoic. Small retroperitoneal lymph nodes are present but are not pathologically enlarged. This is followed by MRI that provides more detailed soft tissue information on the multiseptated mass. There are also multiple solid nodular enhancing lesions along the left pelvic sidewall with encasement around the iliac vasculature (Figure 2B). Figure 2. CTA (A) and MRI (B) of the left psoas mass. Which type of cancer is most likely accountable for this mass? Answer: C In general, psoas muscle sarcomas are rare, accounting for only approximately 1% of all soft tissue sarcomas reported, as skeletal muscle has a natural resistance to malignancy.1,2 Most cases involving tumors of the iliopsoas compartment are secondary extensions of surrounding retroperitoneal, pelvic, or abdominal tumors. It is also extremely uncommon to have hematogenous spread of the cancer to the psoas muscle. A biopsy of the psoas mass is performed and shows neoplastic cells. Oncology specialists decide that the best label for this cancer is sarcomatoid carcinoma. This uncommon form of cancer has malignant cells with histologic, cytologic, and/or molecular properties of both mesenchymal tumors (“sarcoma”) and epithelial tumors (“carcinoma”). This tumor type has not been described as a primary psoas muscle malignancy. The patient underwent chemotherapy, and follow-up positron emission tomography (PET)/CT scanning showed the mass to be smaller. Despite this reduction in size, the patient’s symptoms in his groin and hip persisted. Soon thereafter, he complained of leg swelling, which prompted a venous duplex ultrasound (Figure 3). He was found to have a left iliac deep vein thrombosis that required anticoagulation, thrombolysis, angioplasty, and stenting of the distal common and proximal external iliac veins. His swelling resolved, as well as his discomfort. An inferior vena cava filter was also placed at the time of the intervention. Figure 3. Color duplex image of patent left common femoral vein (CFV) (A) and continuous flow seen in the CFV on Doppler (B) consistent with an iliac vein lesion. GSV, great saphenous vein. Figure 4. A PET scan showing increased activity in the right hip (femoral neck). The patient underwent resection of the mass, with reanastomosis of the left ureter to the right ureter and an interposition graft from the left common iliac artery stent to the left common femoral artery. Several months later, he developed left flank and groin pain from persistent hydronephrosis, which was treated with a nephrostomy tube. Three years into therapy, he presented with a profound right leg limp and constant hip pain. A PET scan showed increased activity in the femoral head (Figure 4). He later developed excruciating right leg pain upon standing due to a pathologic fracture of the right hip and underwent total hip replacement, which resolved his symptoms. He also had recurrent bilateral leg pain with walking. Somehow, he developed a hemodynamically significant isolated infrarenal aortic dissection that was treated with an aortic tube stent graft (Figure 5A–C). His left iliofemoral bypass graft also needed anastomotic “touch-ups” with angioplasty and stenting for recurrent claudication (Figure 5D). He ultimately succumbed to the cancer 5 years after the original diagnosis. These events, managed by multiple specialty services, reinforce the challenges posed by complex leg pain with multisystem involvement. Figure 5. Arteriogram showing an aortic dissection and iliac stenoses (A). Intravascular ultrasound evaluation of the aortic dissection plane (B). Completion arteriogram after stenting, including graft placement in the aorta (C) and stents placed in the iliac arteries (D). How many different diagnoses did this patient ultimately incur for his complaints of back, hip, groin, or flank pain? Answer: D He initially presented with lumbar disc disease (1), followed by left trochanteric bursitis (2), left iliac artery occlusion (3), left psoas sarcomatoid carcinoma (4), left iliac deep vein thrombosis (5), hydronephrosis (6), aortic dissection (7), anastomotic graft stenosis (8), and pathologic fracture of right hip (9). Clinical challenges are common. The right common iliac artery stenosis remains confusing in the ultimate diagnosis (tumor compression/encasement of the left iliac artery/vein), especially because the patient did not have any classic risk factors for atherosclerosis. Anyone who presents with arterial occlusion without a clear explanation warrants a thorough workup prior to initiating treatment. In hindsight, the CT should have been performed during the initial vascular evaluation prior to arteriography. Jumping to a diagnosis can inadvertently lead to a medical conundrum. It is better to stop and think, obtain a new history and physical examination data with each visit, develop a working differential diagnosis and be willing to modify it, and then use laboratory data to confirm the clinical suspicions.3 The right treatment is more likely to follow when this complete process is used with every patient visit. 1. Agar M, Broadbent A, Chye R. The management of malignant psoas syndrome: case reports and literature review. J Pain Symptom Manage. 2004;28:282-293. 2. McKay TA, Bishop S, McKay MJ. 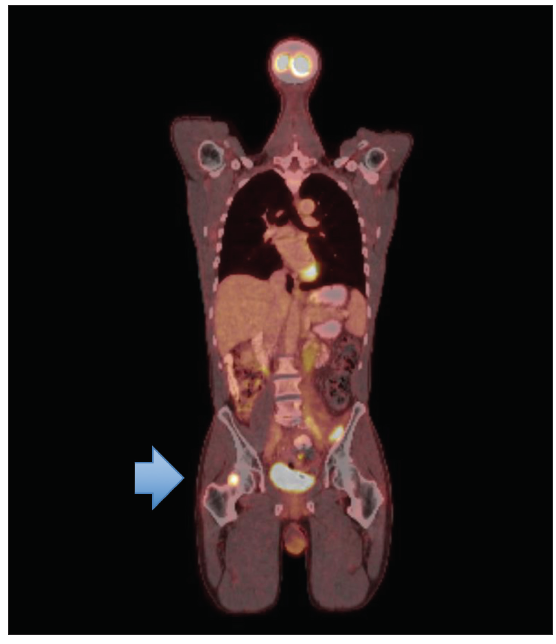 Primary psoas sarcoma causing malignant psoas syndrome: favourable response to radiotherapy. Ann Transl Med. 2017;5:105. 3. Gray BH. From the masters: seven lessons from a master clinician—Dr. Jess Young’s clinical method. Vasc Med. 2015;20:566-568.